Lead your army of frogs and bullfrogs to claim the swamp as your own! There is a quote in the game’s rule book from Sun Tzu, a Chinese military strategist and philosopher, that sums up this game perfectly. “Just as water retains no constant shape, in warfare there are no constant conditions.” In this game, players will be attempting to capture floating territories. When they do, the very landscape they are fighting on shifts and even disappears. The key to victory in this game is not military might, but the ability to quickly adapt. Bullfrogs, designed by Keith Matejka and published by Thunderworks Games, is comprised of 8 Bullfrog meeples (in 4 different colors, 2 per color), 56 Frog meeples (in 4 different colors, 14 per color), 40 Lily Pad cards (in 4 different colors, 10 per color), 4 Player Aid cards, 1 Log card, and 4 “Starting” Lily Pad cards. The meeples are made of thick wood and the cards are as durable as your standard playing card. Excellent quality throughout. To set up the game, first give each player 10 Lily Pad cards, 2 Bullfrog meeples, and 14 Frog meeples all of the same color. Return any Lily Pad cards, Frog meeples, and Bullfrog meeples not used back in the game box. Each player should also be given 1 Player Aid card at this time if needed. Second. place the Log card in the middle of the playing area and then place the 4 “Starting” Lily Pad cards on each adjacent side of the Log card. When completed, your setup should look similar to the following image. Third, each player shuffles their Lily Pad cards and places them face-down in front of them. This is the player’s draw pile. Players should place their Frog and Bullfrog meeples next to their draw pile to help keep the game playing area organized. This collection of meeples is the player’s Frog pool (that just also happens to have 2 Bullfrogs). Fourth, each player now draws 3 Lily Pad cards from their draw pile, keeping the drawn cards hidden from their opponents until played. This is the player’s starting hand. That’s it for game set up. Determine who is the first player and begin. The swamp is a really big place full of giant trees with hanging moss, large bogs, and rich with life. From a frog’s perspective, none of this really matters as the entire world starts and ends in the small pond of water they call home. A player’s army of amphibious warriors is mainly Frog meeples. Each player has an unlimited number of frogs, When one frog warrior perishes, another immediately takes its place. The same cannot be said for the Bullfrog meeple. The bullfrogs are stronger than their smaller frog cousins. They are also heavier. When a Lily Pad sinks, most frogs can swim away to fight another day. Bullfrogs tend to sink and are never seen again. At the center of the frog’s and bullfrog’s universe is the Log card. This is all that remains of an ancient tree that fell into the water and has now become the only trustworthy spot to sit. It’s also considered a place of neutrality where frogs and bullfrogs of different political and religious backgrounds can come together in peace. The Log card is so big that it can easily hold the entire frog and bullfrog population of the pond without sinking. The “Starting” Lily Pad cards are just like the players’ Lily Pad cards, but are neutral. Which is not to say that can’t be won. Like the other Lily Pad cards, the “Starting” Lily Pad cards are disputed territory. If the Log was a place a refuge, the Lily Pads are best thought of as the war zones. Each floating leaf is a small kingdom to be controlled. The Frog and Bullfrog meeples placed on a Lily Pad card occupy open spaces. Due to the small size of the Lily Pad, only so many meeples can be placed on them at a time. Bullfrogs is played in rounds with no set number of rounds per game. Each player will have 1 turn per round, starting with the first player. A player’s turn is summarized here. Where noted, the term “active player” is used to identify the person who is currently taking their turn. The player selects 1 Lily Pad card from their hand and plays it to the middle of the playing area. A Lily Pad card may be placed anywhere as long as it’s adjacent to a previously played Lily Pad card. Adjacent means that one or more sides of the card are parallel to another card. Diagonal placement is not allowed. 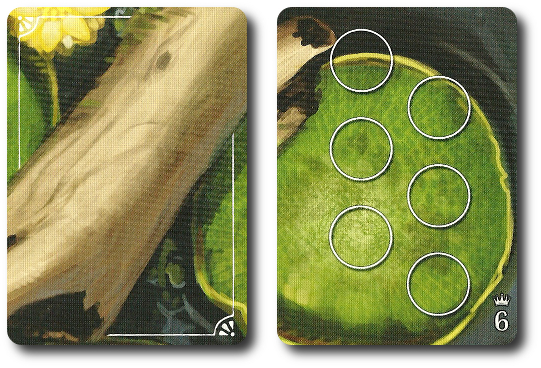 Additionally, when placing the Lily Pad cards, it’s not necessary to ensure the illustrations on the cards align. The Deploy action allows the player to take 1 Frog or 1 Bullfrog meeple from their Frog pool and place it on any open space on a Lily Pad card that is in the same row or column as the Lily Pad card placed during step 1. However, the same meeple cannot be played to the Lily Pad card that was just placed, nor can the meeple be placed on the Log card. Additionally, no more than 2 meeples can be deployed to the same Lily Pad card during the player’s turn. If the player no longer has any Frog or Bullfrog meeples in their Frog pool, they may take any Frog meeple (not a Bullfrog meeple), and place it as if they just grabbed it from their Frog pool. The Sabotage action allows the player to move 1 opponent’s Frog meeple from one Lily Pad card to any other Lily Pad card in the same row and column as the Lily Pad card that was just placed. This includes the Log card. There must be an open space on the card the Frog meeple is being moved to before it can be picked up and relocated. There are only 2 restrictions to the Sabotage action. First, an opponent’s Bullfrog meeple can never be sabotaged. They are too fat to be moved. 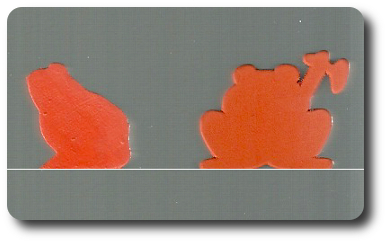 Second, Frog meeples on the Log card cannot be moved as part of the Sabotage action. After the player has taken their actions or decides to take no further actions, the Lily Pad cards are scored. Only those Lily Pad cards that have every space occupied with a Frog or Bullfrog meeple are considered during this step of the game. 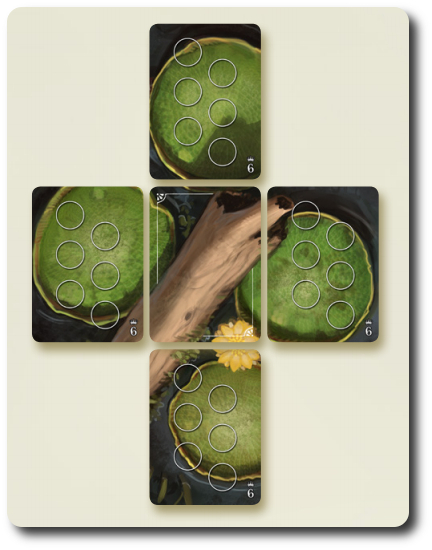 If there is more than 1 Lily Pad card ready to score, the active player decides the order in which they are scored. Each player counts their total combat strength for the Lily Pad being scored. Every Frog meeple is worth 1 strength and every Bullfrog is worth 2 strength. The player with the most strength wins the battle; however, if there is a tie, no one wins the battle. The Lily Pad card now starts to sink into the swamp due to the battle that ensued on top of it. The active player now gets to move the Frog and Bullfrog meeples by jumping them to open spaces on adjacent Log and Lilly Pad cards. There is a priority order in which the meeples must be moved. Only 1 Frog meeple or 1 Bullfrog meeple can be moved to an adjacent card and each adjacent card can only be used once. This means that no more than 4 meeples will ever be moved. Move all Frog meeples belonging to the players who lost the battle. Move all Bullfrog meeples belonging to the players who lost the battle. Move all Frog meeples belonging to the player who won the battle. Move all Bullfrog meeples belonging to the player who won the battle. In the event of a tie, the active player is considered the winner and moves their meeples last. Any Frog meeples that remain on the Lily Pad card are picked up and returned to their owner’s Frog pool. Any Bullfrog meeples that remain are out for the duration of the game and are returned to the game box. The winner of the battle now takes the sunk Lily Pad card and places it face-up in a Score pile in front of them. If the battle resulted in a tie, the Lily Pad card is removed from the game and is returned to the game box. After having resolved the battle on one Lily Pad card, the active player looks for any others. Due to the Frog and Bullfrog meeples jumping about, new Lily Pad cards might be full and ready to score. This continues until all the Lily Pad cards that are full of Frogs and Bullfrog have been battled, scored, and resolved. After all the battles have been resolved, there might be one or more Lily Pad cards that are no longer adjacent to at least 1 other Lily Pad card or the Log card. It’s also possible that two or more groupings of Lily Pad cards might be on the table. The active player now slides any Lily Pad cards that need to be brought back into proper position. There are a few rules when it comes to sliding cards. The Log card can never be moved. It’s in a fixed position that all the other Lily Pad cards attach to. Lily Pad cards are moved 1 at a time and can be moved any number of card spaces. When organizing the new Lily Pad grouping, attempts should be made to ensure the Lily Pad and Log cards are not in a single line. Any Frog and Bullfrog meeples on the Lily Pad cards travel with it, remaining in their current space. The end result should be a single grouping of all the Lily Pad cards in play with the Log card. The Log card need not be in the middle of the grouping. 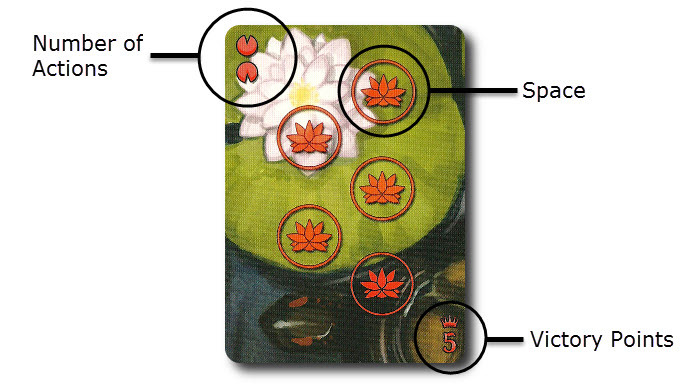 The final action taken by the player is drawing 1 Lily Pad card and adding to their hand. If the draw pile is ever empty, the final step is skipped. The game comes to an end when the active player plays ends their turn and all the players have played their Lily Pad cards in their hand. It’s now time to complete the final scoring. Each player now takes the Lily Pad cards they placed in their Score pile and adds the Victory Point values. For each Frog meeple the player has on the Log card, an additional +1 Victory Point is earned. 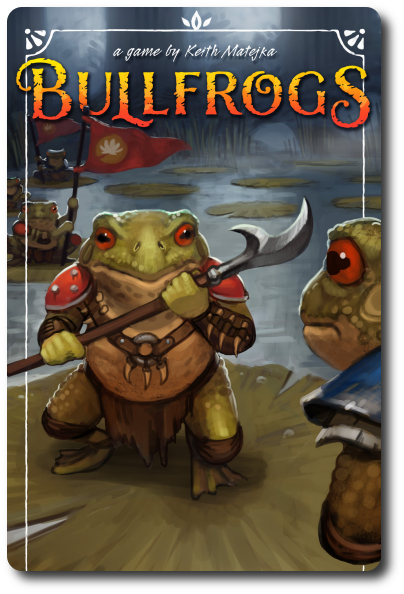 For each Bullfrog meeple the player has on the Log card, an additional +2 Victory Points are earned. The player with the highest combat strength value on the Log card earns an additional +3 Victory Points. When all the points are calculated and added together, the player with the highest number of Victory Points wins the game and the swamp. A very rudimentary print-n-play version of the game can be freely downloaded if you would like to try the game before you buy it. The PDF is available from the game publisher’s website or click this PDF link. The game’s rule book is freely available, too, giving players everything they need to play without actually giving the player all the bits. Like all print-n-play games, you’ll have to do the work to build the game before you can experience the fun at the gaming table. To learn more about Bullfrogs, visit the game’s web page. The Child Geeks got a real kick out of the Frog and Bullfrog meeples. The Bullfrog was by far the favorite due to it sporting a large ax. Once the Child Geeks were done marveling and talking excitedly about frog samurai, we got down to business. All the Child Geeks understood how to play the game, but only the older Child Geeks grasped the need to use strategy and tactics to win the game. According to one Child Geek, “I really like this game. It’s easy to play and fun. The hardest part is knowing which cards to play. No, the hardest part is knowing when and where to move your frogs! It’s all hard, but it’s also a lot of fun.” Another Child Geek said, “I thought this game was going to be like Frogger, but it’s more like Chess. I think it might be both.” While the younger Child Geeks were oblivious to the game’s strategic nature, they had just as much fun as their older peers. One very excited Child Geek said, “I love sinking Lily Pads!! !” When all the frogs were sent home, the Child Geeks unanimously agreed to approve Bullfrogs. 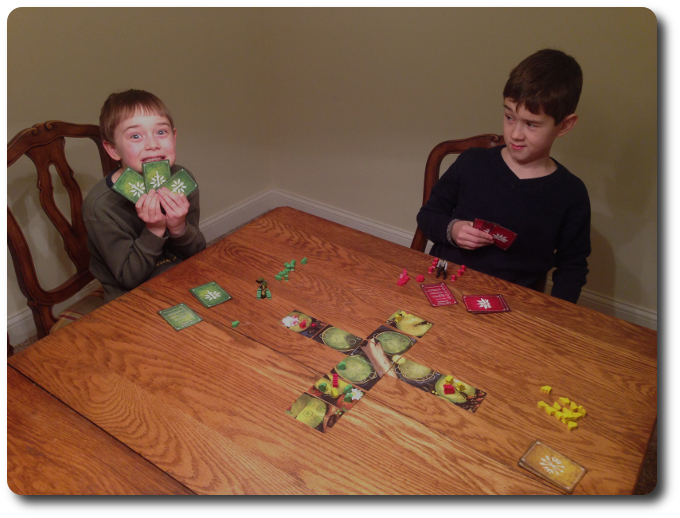 As you can see, some of the Child Geeks took to the game like a frog to water…. The Parent Geeks were also pleased with the game, finding it not only to be an entertaining and challenging experience with their children, but also with their peers. According to one Parent Geek, “This is a game that allows a player who uses strategy and tactics to always have a slight advantage, but the shifting game playing area makes it almost impossible to completely conquer.” Another Parent Geek said, “I’m really impressed with this game. I didn’t think much of it when you dumped it on the table – it was so small – but this game plays like a much bigger battle game. Really good stuff.” Non-gamers, casual players, and gaming enthusiasts all enjoyed themselves, finding Bullfrogs to be a game of both skill and manipulation, blending everything great about a Wargame without the overhead of heavy rules. All the Parent Geeks voted to approve Bullfrogs. The Gamer Geeks found Bullfrogs to be an excellent Abstract Strategy game, but stopped short of calling it a Wargame. According to one Gamer Geek, “This game has elements of combat, but it’s abstract. This is a game about area control and management of resources. These are elements found in Wargames, but this is not a Wargame by any means.” All the Gamer Geeks agreed and also agreed that it didn’t matter. They found Bullfrogs to be an enjoyable challenge against their peers and they very much enjoyed how luck never once played a part in any of the decision making. As one Gamer Geek put it, “When you introduce luck, you reduce a player’s ability to make meaningful choices. I’m glad luck plays no role in this game.” When I asked the Gamer Geeks what they thought of the ever-changing playing area, they had mixed feelings. One Gamer Geek said, “I like it. It keeps everything in motion and you must constantly reevaluate your position.” And another Gamer Geek said, “I’m not against it, but it does make it difficult to strategize your next move when every battle changes the very field you are fighting on.” When all the games were over, the Gamer Geeks voted to approved Bullfrogs, finding it to be an enjoyable casual game with an excellent depth of play. I was pleasantly surprised with Bullfrogs. It was a much deeper and strategic game than I originally thought it would be. It’s tactically light, but don’t let that fool you. While the choices a player can make are limited in scope, the impact of each decision can create a chain of events that greatly alters the landscape. From moving meeples to shifting the position of cards, the subtleness of each seemingly small action has long-lasting effects. As such, when a player adds a meeple or moves a card, they are setting up for future moves, not only the current objective. My favorite aspect of the game was the shifting landscape. This kept me on my toes and made the game much more interesting. By being able to change the location of cards after a battle, you could set up the next battle by bringing your forces closer together or weakening your opponent’s forces by separating them. My least favorite was the Sabotage action. All our players had a love/hate thing going with the ability to move an opponent’s meeples. When it was your turn and you got to move an opponents’ pieces, things were great. When someone moved yours, not so much. Everyone easily adapted to it, finding it to be an interesting way to portray the confusion of war, but that seldom lessened the sting. Like the sinking Lily Pad cards, players came to understand that nothing in the game was permanent. The final point I would like to make is the actual battle itself. The goal is to win the battle so you can claim the Lily Pad card, but that in and of itself is not enough to win the game. Additionally, being in a battle as the weakest player is not a bad thing, as it means your frogs will live to fight another day while the winner will most likely lose frogs. This “give and take at a cost” theme underlines everything in Bullfrogs, creating a natural balance. If you tip too far one way, you’ll get the result you want, but will pay more for it. Likewise, not tipping at all will result in nothing, but it’ll also costs you nothing. The middle road is often difficult to find and even more difficult to stay on, making each player’s turn an exercise in readjusting and reevaluating your current strategy. I do not personally consider this to be a deep game, but my perspective is somewhat clouded. After playing many games for many years, you tend to lose perspective on such things. Which is exactly why I have so many people help me review a game. Younger and less experienced players found Bullfrogs to be a game full of twists and turns, while the more experienced and elite gamers were able to work through it with ease. In all cases and with all groups, the game was found to be solid and fun. If you are looking for a casual game full of abstract strategy and where victory is never certain, do sit down a play a game of Bullfrogs. I think you’ll find it be a great mix of tactical fun and critical thinking. Kermit the Frog said it wasn’t easy being green, but he failed to mention the reason why. The reason is simple: frogs are deadly warriors. Tagged Abstract Strategy Games, Animal Games, Card Games, Child Geek Approved, Father Geek Approved, Gamer Geek Approved, Parent Geek Approved. Bookmark the permalink. Thanks for the review, Cyrus! Thanks for the sharing your game!